"He told me there was a woman dead down there in the woods. He said she was dead and said for me to go and see. [...] We went down and I saw a white apron hanging on a bush and, a few yards behind it, a woman's feet which were turned towards me. I didn't go very close, but I saw from the blood on her that she had been shot and was dead." - Harriet Pratt, quoted in the Twin-City Daily Sentinel of July 21, 1892. 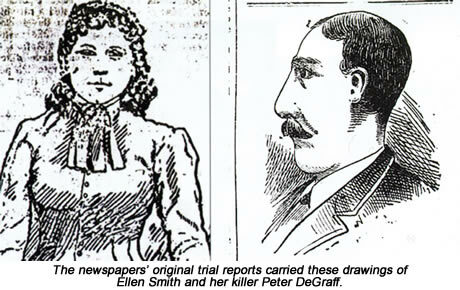 There were two Peter DeGraffs, Bad Peter pushed the besotted Ellen Smith away, refused to wed after making her pregnant and beat her when she pursued him. Good Peter begged Ellen to stay with him, suggested names for their child and protested his love for her even on the gallows. Bad Peter shot Ellen dead at a secluded spot on the outskirts of Winston and blackened her name in court to try and save his own skin. Good Peter took extraordinary risks to ensure her dead body was quickly found, and later tried to rescue her soul from damnation with a sunset ritual at the murder scene. Fam Brownlee, a local historian in Winston-Salem who's studied the case, sees DeGraff's dual nature as central to its story. "I don't get the feeling that he planned to kill her," he told me when we met at Forsyth County Library. "Cold-blooded murder does not sound like Peter at all. Look what he did - he took her apron off and hung it on a branch. And then he put her body on some greenery like a bed. That doesn't square with this cold-blooded thing. I think he was probably pretty horrified." But God knows I'll die as an innocent man. But I'll never be free from my sins of the past. But the Bible plainly tells us you've gone down below. The title Poor Ellen Smith now tends to be used for all these ballads, no matter which set of lyrics it's attached to. The two core songs' identical metre - chosen to fit the popular old hymn tune How Firm A Foundation - has allowed their lyrics to migrate freely back and forth for at least 65 years. Asking which of the two strands any particular post-war version of the song descended from almost always produces the answer that it's a mixture of both. The truth of the killing itself is no picnic to unravel either. First, there's the fact that DeGraff was a congenital liar, contradicting himself almost from one minute to the next in whatever he told police, reporters and the jury at his trial. Winston's newspapers lapped up every word of the swashbuckling self-portrait he gave them, but even they felt obliged to add a disclaimer. "DeGraff does not tell the same story to everybody that goes to see him," the Western Sentinel warned. "DeGraff talks freely and leaves the impression he is a pretty big liar," added the Union Republican. Even the court papers from DeGraff's trial can't be entirely trusted. A careless mistake on his arrest warrant, dating Ellen's murder a month earlier than it actually occurred, was slavishly copied on several later documents, including the jury's official verdict. The result is a set of trial records which cannot agree whether she died in June 1892 or July the same year. Another complication springs from the way Ellen's story became embroiled in Winston's party politics. The Twin-City Daily Sentinel, which supported the Democrats, had a long-standing grudge against Forsyth County's Republican sheriff, Milton Teague. DeGraff remained at large for almost a year after killing Ellen, and the T-CDS used this as a stick to beat Teague at every opportunity. Unfortunately, the paper was so rabid in this campaign that it often dressed up the most casual item of local gossip as if it were concrete fact, creating a whole new layer of distortion for our own age to stumble over. "After the initial report of the murder, they just took off after the sheriff," Brownlee said. "Every week they had an article saying, 'Peter DeGraff has been seen here, here and here in the city, and the sheriff has done nothing'. That wasn't true, because nobody had seen him and he wasn't here." The Union Republican - a GOP paper, of course - defended Teague by calling the T-CDS coverage "incessant bosh" and soon both papers were devoting as many column inches to attacking one another as they were to reporting the case. Then there's the folklore to contend with. Many accounts of Ellen's death will tell you she was mixed-race, simple-minded or pregnant when she died, but there's not a scrap of evidence for any of these assertions. The idea that her song was once banned by law for fear it would provoke a riot is equally unfounded. Because Winston is only 55 miles from Tom Dula's Wilkesboro, many myths about his execution have attached themselves to Peter DeGraff too. These were untrue even in their original form, and become all the more so when people graft them to the wrong case. Take all these elements together, and you'll see why the story behind Poor Ellen Smith has become one of the most confused and misreported in the whole murder ballads genre. Let's see if we can straighten it out a bit, shall we? To continue reading my Poor Ellen Smith essay, please go to its Amazon Kindle page (US / UK). It's available there as a stand-alone chapter from my 2016 book, Unprepared To Die, and will cost you just £1.49 ($1.85 in US). Amazon has a free app allowing its Kindle titles to also be read on smartphones, tablets and computers. All contents © Paul Slade 2016 unless otherwise stated. All rights reserved.